Today, the A-10 Warthog comes in standard “Compass Ghost” gray paint with some killer nose art for looks …. depending on the squadron. Times have changed. The A-10 hasn’t always been so plain. One of the most obscure is the frosty-painted “Snow Hog” from early in the warplane’s career. 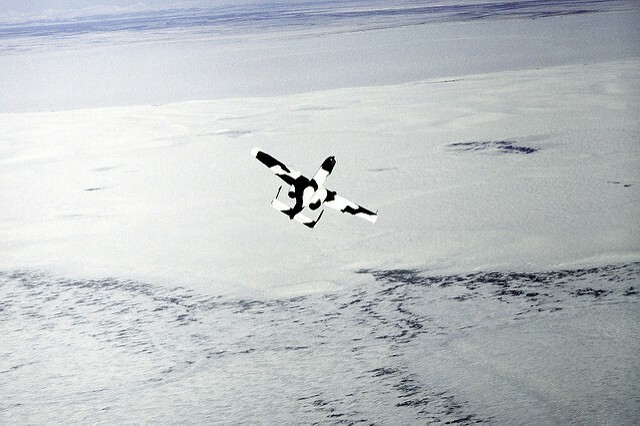 This white and very dark green — almost black — Warthog flew for several days during Exercise Cool Snow Hog (yes, really) in March 1982. Here’s the background. 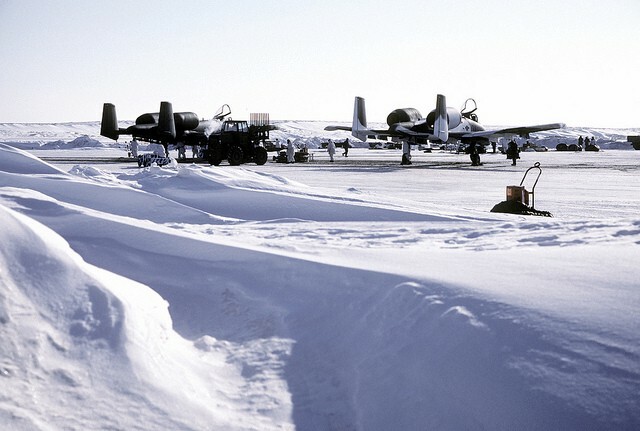 In December 1982, two A-10s from the 343rd Composite Wing made the trip from their Fairchild Republic factory in Maryland to Eielson Air Force Base in Alaska. 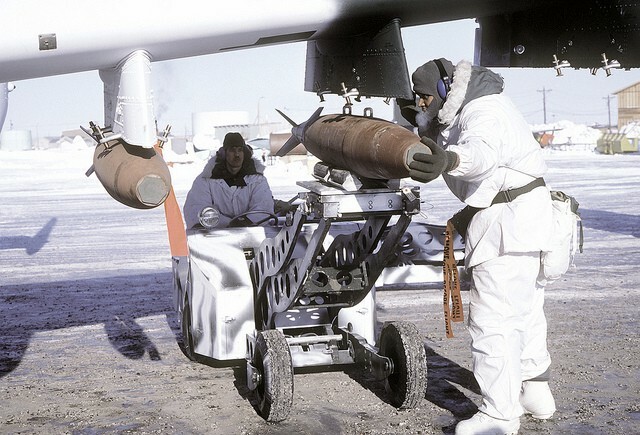 From there, one of the Warthogs received the winter paint job, and the pair of ground attackers moved to a “forward operating location” in Kotzebue, Alaska for the March “Cool Snow Hog” exercise, according to an official Air Force historical review in 2007. 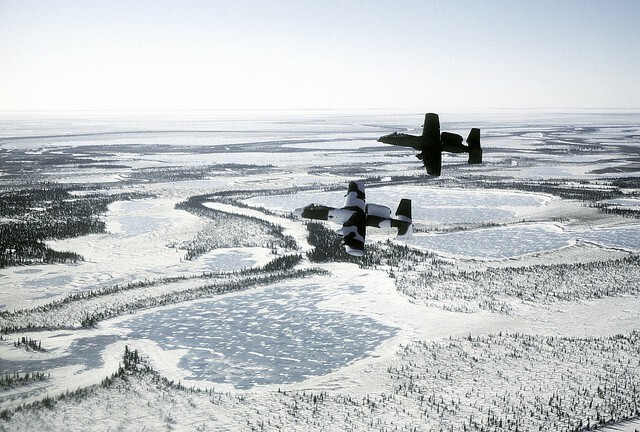 The Air Force never permanently stationed A-10s near the Arctic. Nor was there any real military utility for them in Alaska, apart from training. The Warthog is a close-air support plane brimming with missiles, bombs and a 30-millimeter Gatling gun, and was originally designed to destroy Soviet tanks in Europe. It never fought its Soviet enemy directly, but the A-10 has — in the 25 years since the end of the Cold War — flown combat missions in Iraq, Afghanistan, Libya and the former Yugoslavia. But Cool Snow Hog wasn’t the only time A-10s went to Alaska. Exercise Scalp Hunter in August 1982 — also set in Alaska — saw two A-10s (flying under the exercise name “Cobbler Fire”) practice evading Army troops from the 4th Regiment, 23rd Infantry Battalion. These troops had FIM-43 Redeye anti-aircraft missile launchers (the predecessor to the Stinger) equipped with infrared seekers. Army electronic warfare officers practiced jamming the Warthogs’ communications, and quite successfully. Lt. Col. Charles Parker of the 18th Tactical Fighter Squadron blamed the limited airspace of the training area for the Warthog’s inability to escape the jammers. Parker offered several recommendations for future exercises. For one, the Pentagon should allow more space for the A-10s to maneuver, he wrote. In the event of World War III with the Soviets, the Warthogs wouldn’t be bound by such tightly-imposed airspace restrictions. Second, the jammer should be “protected by a high threat weapons system” and have more sophisticated equipment for sweeping a wider band of frequencies. “We found that we tended to employ counter measures that were based on the limitations of the jamming equipment used, vice the actual Soviet equipment,” Parker wrote. But sloppy or not, it looked great. There may be Air Force generals who think their planes’ paint schemes need reining in, with uniform and utilitarian gray on everything. I am adamant that the opposite should be the case.